A bit of a secret project! Malie bean MhicAoidh commissioned four suncatchers of the Rivenstar badge. Two for Moonwulf and Takaya, retiring as Baron and Baroness Rivenstar after 40 years (!!) of service, and two for their successors, then-unnamed. Irony being what it is, Malie and Adhamh were selected. They still wanted their two, however! The first two were made out of a dark cobalt blue glass. Very pretty. Unfortunately I didn't have enough for all four from that glass, and realized it after the first was done. I checked with Malie and she was ok with them being in sets of two. The other set (pictured above, being held by her then-almost Excellency) are made from Spectrum Dark Blue cathedral. The clear on all four is a seedy Kokomo. I have a thing for seedy glass! All four are wrapped with 1/8" zinc u-channel came and have ~1' chains. 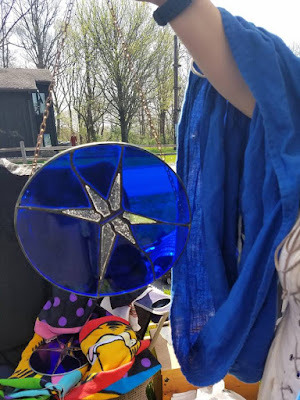 They seemed pleased with the suncatchers, and I'm quite glad for it. Black Patina for Zinc does actually work... As in the past, I was getting fairly irritating results, weak and blotchy. I read the directions (...) and realized it implies you should apply it fairly heavily. It also says to leave it at least 15 seconds. Being patient with it, the patina does eventually work fairly well. 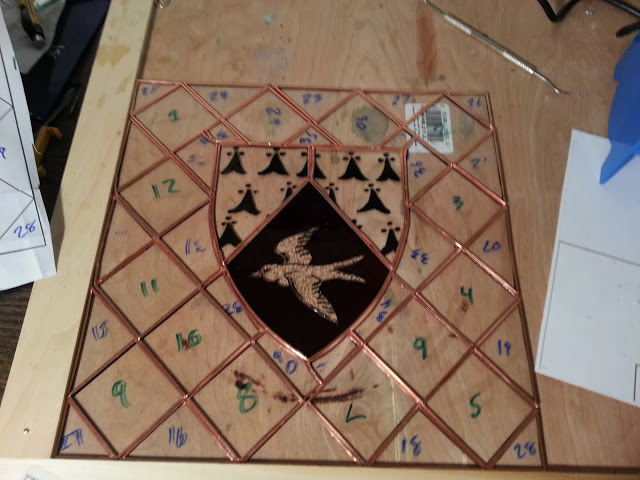 The two diagonal points, 8 and 11 in the picture above, are tricky because of the flanged base I put on them. Initially I tried cutting them out as "S-curves" and at that tiny size, It worked much better to do it as two C-curves. And cutting it! I usually use my lead dykes on it, but it deforms the end terribly. Makes it hard to get a clean joint on the other end of the circle. This time I cut the "leaves" individually, and then flexed it to snap the heart via metal fatigue. That gave me a much cleaner end to work with. Chain. Always buy more than you think you'll need. 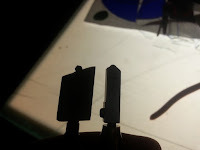 And mounting them on a 180-degree arc (straight horizontal line) was not a fantastic idea, as the suncatcher wants to tip a bit. I used to work with Laurencia and her husband, Eirikr inn havi four or so years ago. A few months ago he messaged me on Facebook to ask if I could do her device for her upcoming elevation. Knowing her elevation was to be at Ice Dragon in April, I sat it on it for bit. Too long, but ok in the end! I seem to recall being told Laurencia is part of the "14th century mafia" so I wanted to pick a design that was appropriate to her period. 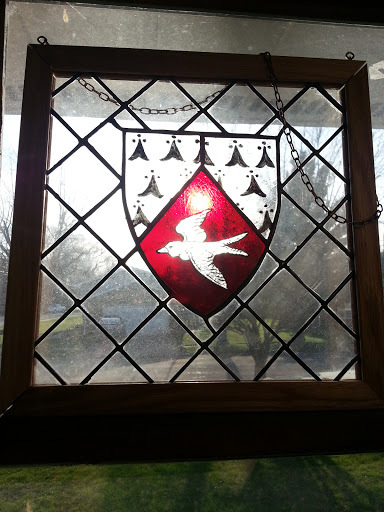 Looking at extant panels from France and England, I found several of an armiger's device set in "plain glazing" or a window of clear glass. Frequently we do quarries with more acutely angled points, diamonds like the suit on playing cards. In several windows of this time, however, I saw they were the 90-degree style diamonds. The more acute style seems much more prevalent in late-period windows, I'd like to dig into those changes sometime. At one point I thought about setting her device in a ring of laurel leaves, but I found it very difficult to do so within a reasonably-sized window. I tried scaling my pattern up from 12 to 14 to 16 inches square, but I couldn't find proportions that were acceptable. Either the ring was too thin, or the device too small, or the combination awkwardly placed in the pattern. I eventually dropped that plan and just focused on her device. The edge-on view gives it away. The green is caused by iron impurities, though a few sources claim some copper content can do that as well. Ensuring the iron is kept out, or adding selenium or lead, causes a clearer glass as with the other brand here. If I'm not mistaken, it's the St Just that is green. 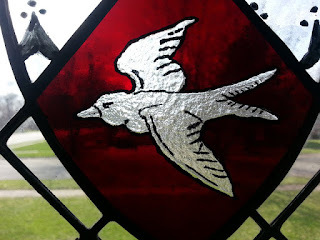 The flashed glass I used, red flashed on clear, is of unknown provenance via THL Molly Sotherden, but despite hearing of it's existence I've yet to find machine-rolled flashed glass. Looking at the irregularities, I feel very confident it is mouthblown as well. 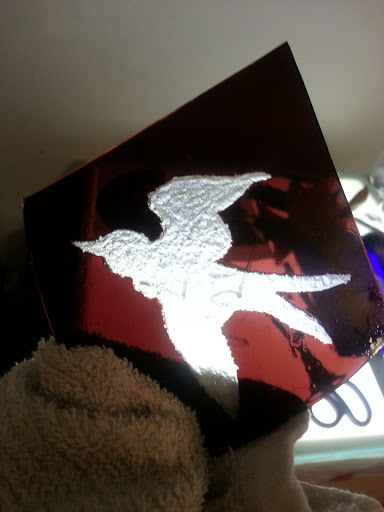 I learned during this project that flashed glass can be a striking color (See Lessons Learned section below). Flashed glass has a thicker base layer of one color (usually clear) and a thinner layer of another. It is one solid sheet of glass with two distinct sides. Originally this was done because otherwise some colors were too dark to transmit light (red is the best example). A sheet made in the typical way would appear black. 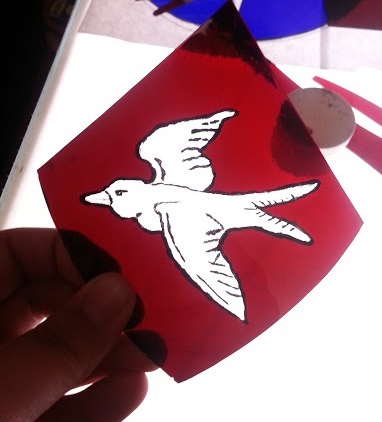 Giving a thin layer of color to a clear sheet allowed the red to shine through and remain strong enough to use. In the 14th century it became well-known that you could remove the colored layer and add extra detail without adding leadlines. 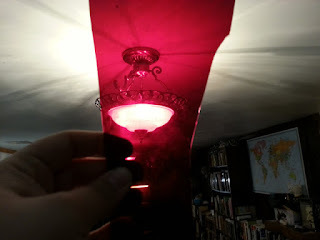 At this point in time, most glass cutting is done with a dividing iron (a red hot poker used to incite thermal shock in the glass to give it a crude shape), which can be seen in my post here and the video to which it links. 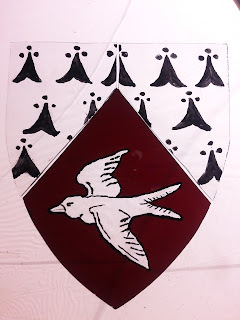 The shape would be refined through a grozing iron (I now use a proper grozing iron made for me by THL Kendrick Cameron, but my original one can be seen here). About this period in time, diamond-tipped cutting tools are becoming known in Italy. 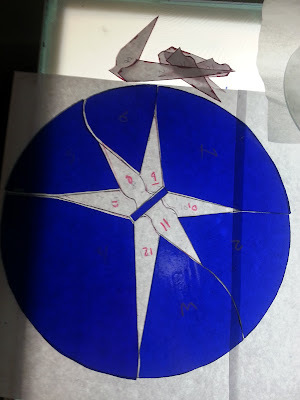 I own an antique diamond-tipped cutter and used it a little for this project; unfortunately it is rather temperamental and I wasted half a sheet of clear glass trying to make it work. As a result the majority of the cuts use a modern carbide-wheel cutter to save glass/money. Period sources talk of either abrading away the flashed side, or using acid to etch it away. 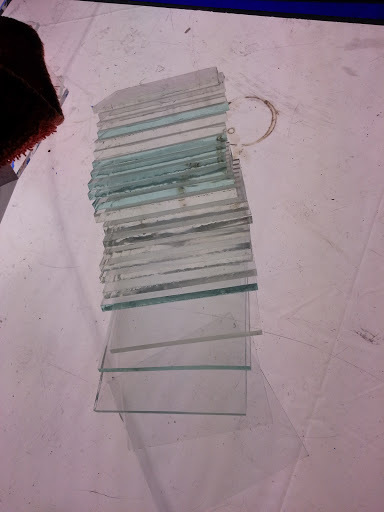 The acid called for in period is generally not strong enough to etch glass unless it is of very poor quality (and hat tip to my Laurel, Mistress Kirsten Thorsteinsdottir, for that fact). Modernly we can use a stronger acid, power tools, hand abrading, or sandblasting. Sandblasting and acid end up with very similar results. Having tried all of these options in the past, and wanting a certain "hand abraded" look on "power tool" time tables, I abraded it using an engraving tool. It is less drastic than a dremel, and after firing I think it looks excellent. The water bath is probably not period, but we prefer to avoid death by silicosis today! The picture on right is the piece before fire polishing. I applied vitreous paint to the bird using a miniver brush, as called for in our primary source texts. Period formulas for vitreous paint call for crushed glass and mineral/metal oxides for color. Modern texts reference using glass fluxes and components, rather than actual glass, for making paint, however the oxides are still in use. I fired the three pieces, bird and two halves of the ermine section, in my modern electric kiln. My tests on proper period kilns are still forthcoming and, again, the glass is expensive to waste! The entire device, fired. I aligned the ermine spots to coincide with the lead line to try and mask it a little. Fully period cutting tools might have been able to get that steep inner angle cut out of one piece of glass. Might. I cut the background of quarries and got stuck worrying about the next steps. Obviously lead came would be the period technique, and cast cames at that. 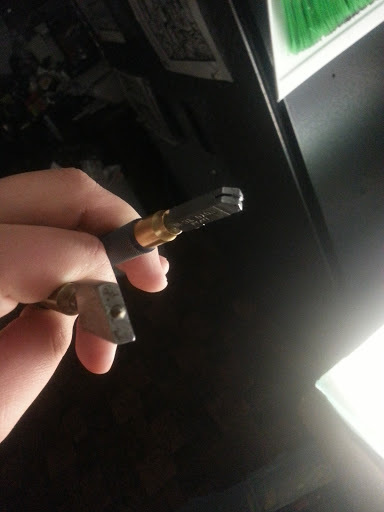 I would have to use purchased milled cames, but my skillset with came is very rusty, and it's not as strong. In order to have a strong, lower-maintenance, and better looking end product I opted to use modern copper foil methods to assemble the window. That would be the biggest concession to modernity but I feel it was/is the right call. I put the completed panel in a wooden frame, which is called for in our primary sources. I added modern hanging hardware (eyelets and rustic copper chain) for Laurencia and Eirik's convenience. I hope that it arrived unbroken and that it is only one of many beautiful things she gets on the day of her elevation! 1) Diamond-tipped cutters are finicky! 2) From a discussion with Conor O'Ceallaigh, after fire polishing some non-yellowing lacquer could smooth out the texture further. I had several kinds on hand, but I wanted the abraded texture to remain. 3) I need more practice with framing stock. These pieces fit fine when I cut and test fit them, and held while I handled them after gluing. When I added the support brackets on the back, the joints popped a bit and gaps appear. OI! 4) This is only the second time I had an issue with a glass color striking on me, and the first was understandable as it was a green enamel. My sheet of red flashed was in two pieces; I knew one end was a prettier red and the other end was an odd brownish-purple color. 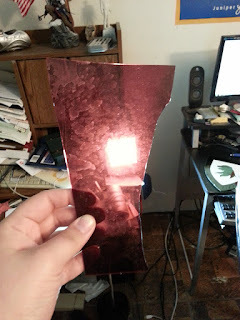 I couldn't find the larger sheet with the better end, only a significant piece from the brownish-purple side. Remembering a funny story involving this piece two years ago (which I only told on Facebook, I'll add it here later today), I checked it against two different light sources. Sure enough, backlit by an incandescent bulb, it was beautiful ruby. Against fluorescent or sunlight, purple-brown. Color being what it is between devices and cameras, this is the best I could do. Since yellow light turns it ruby, I thought I could hit it with some silver stain to bring yellow into the mix, and have a piece that was actually red. 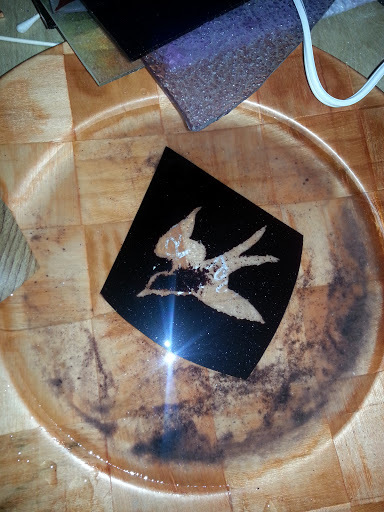 I fired a test chip and when I pulled it out of the kiln, I was shocked to discover I couldn't see where the stain was. 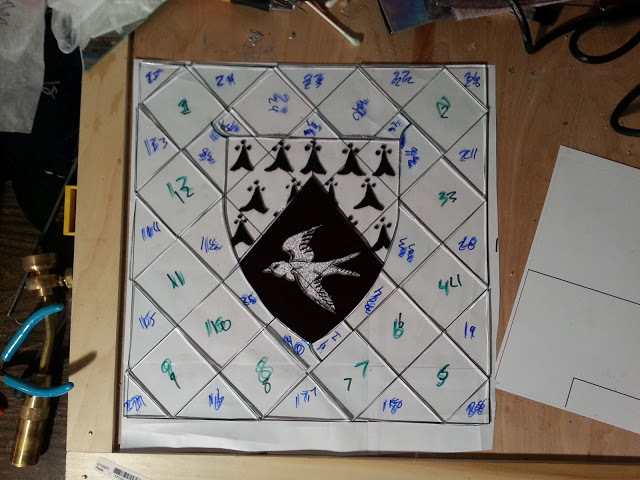 I was a bit disheartened and considered plans B (enamel) and C (piecing it together). Then I realized I couldn't tell where the stain was on my test chip because the entire piece had turned ruby. This is actually the unfired piece from the picture above lit by a different lightbulb, but this is how the finished piece looks in all light as you can see in all the other pictures. That was fascinating and a surprise!